CAMI Research Inc. (Acton, MA) is offering a comprehensive upgrade program to owners of its original (serial port) M2 and M3 testers that will help expand test capabilities and productivity. These systems were manufactured between 1997 and 2010, and this program is typical of the company’s dedication to delivering excellent and sustained customer service. Upgrade orders placed before the end of the year will receive a free, warranty extension. A leader in development of PC-based Cable & Wire Harness Test Systems for over 20 years, CAMI offers the CableEye suite of Low and High Voltage products complete with accessories. Users interact with any of its models through an identical GUI, as the systems are united by a common platform. 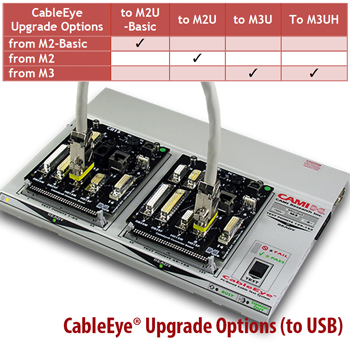 Renowned for its dedication to custom service, CAMI continues to support its original serial port M2 and M3 models and is offering upgrades of these systems to USB giving faster (x4) measurement capabilities. For far less than the price of a new system, CAMI Research will upgrade M2 ( Basic and Full) and M3 testers. All upgraded systems will be returned to the customer with a new, renewable one-year warranty, the latest software, and newly calibrated (if upgraded to M3U or M3UH). This is a great opportunity for customers to expand their test capabilities beyond more rapid testing: If looking for additional sensitivity, upgrading to an M3UH would be the preferred path. Compare upgrade model specifications at camiresearch.com/Catalog_Links/Technical Specifications.pdf. As with all systems under current renewable warranty, each upgraded system will receive the latest software and all updates for one year. In cases where the unit has been out of warranty, the customer will be able to access some great new features such as touch screen operation, simplified automation screen interface, and Zener diode measurement. This upgrade program is available immediately. All upgrades include CableEye’s standard, renewable one year Warranty that is combined with free tech support and free software upgrades. Order a serial port to USB model upgrade before Jan 1, 2016 to receive a free, one-year warranty extension. Note: Prices are USA only and subject to exchange rates, freight and import costs. Contact your local authorised distributor for local pricing.